The only thing more frustrating than a dirty motorcycle is a badly-cleaned motorcycle. 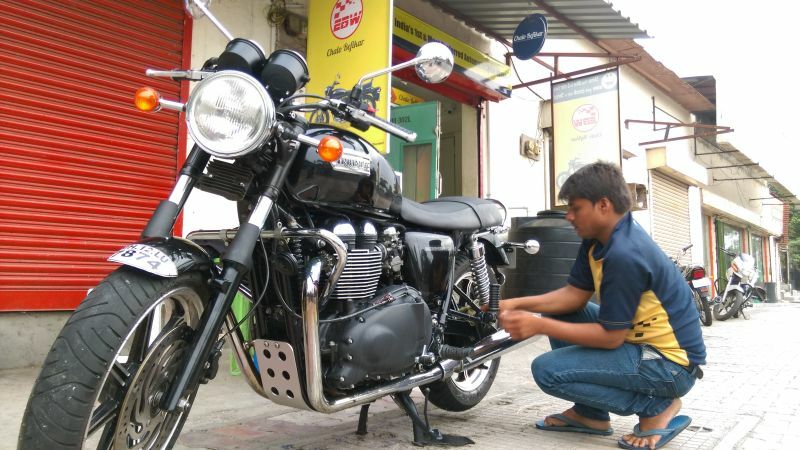 Most of our local washing centres don’t do justice with their quick shampooing, haphazard spraying and dirty rags; they miss hard-to-reach spots that collect dirt and grime on long rides, and return bikes that look patchy rather than pristine. In addition, lazy manpower and a slapdash approach cause wastage of water and time; both valuable resources. 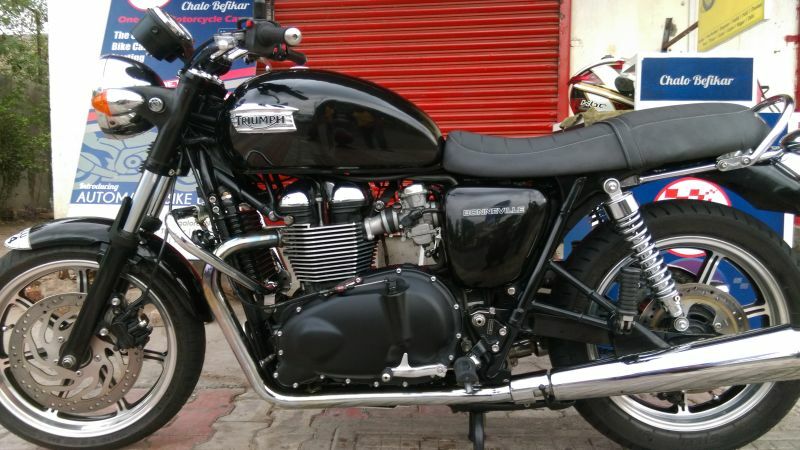 A trio of dedicated bikers saw the opportunity, quit their well-paying jobs in various MNCs, and from an idea that was born in early 2012 established the firm Entropy Innovations Pvt Ltd, of which Express Bike Works (EBW) is a sub-brand. 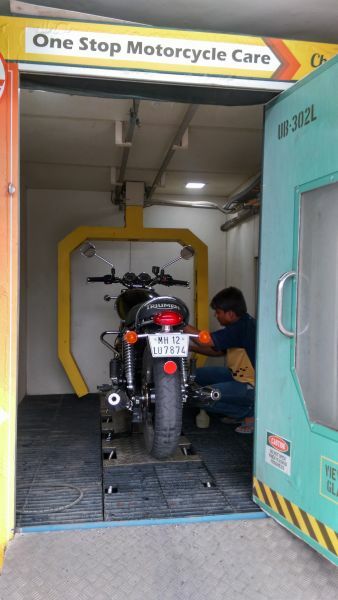 These guys spent 8 months developing this completely indigenous automated bike washing booth, launc hed it at India Bike Week 2014, and haven’t looked back since. 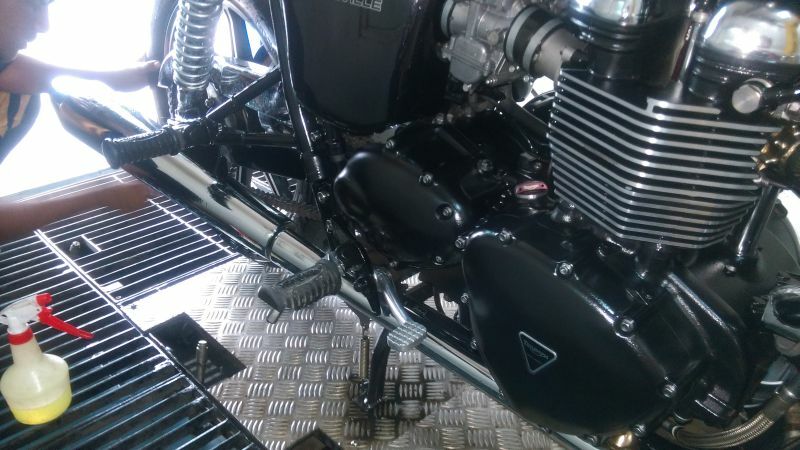 These units have proved their efficiency and durability at authorised service centres of Hero, Royal Enfield and Honda, where duties may extend to over 200 bikes a day. EBW also has franchisee-owned stores in several Indian cities and they have big plans to go international. Degreasing in progress. Note the oscillating water sprayers in the floor. At the moment EBW are planning to take Pune by storm with 25 stores across the city, and I happened to stumble upon the first of these located at Mundhwa. Naturally I was intrigued by the two-metre tall, two-metre wide and three-metre long box that proposed to clean my bike within five minutes and at a reasonable cost; so I rode up the ramp, parked the bike and stepped out. 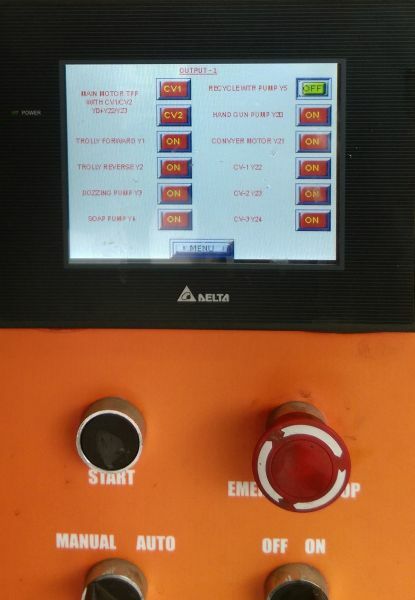 The doors were closed and an attendant programmed the machine via a touchscreen console. Fancy. Visible through observation windows, the bike was thoroughly sprayed all around with soapy foam and then water, from pressure jets in the floor and an automatic sprayer that moved along the length of the booth. An attendant took care of the dirt within the mudguards with the integrated hand-held sprayer and within five minutes the bike was being rolled out to be dried. Of course, this five-minute basic wash only applies to a bike that is reasonably dirty. 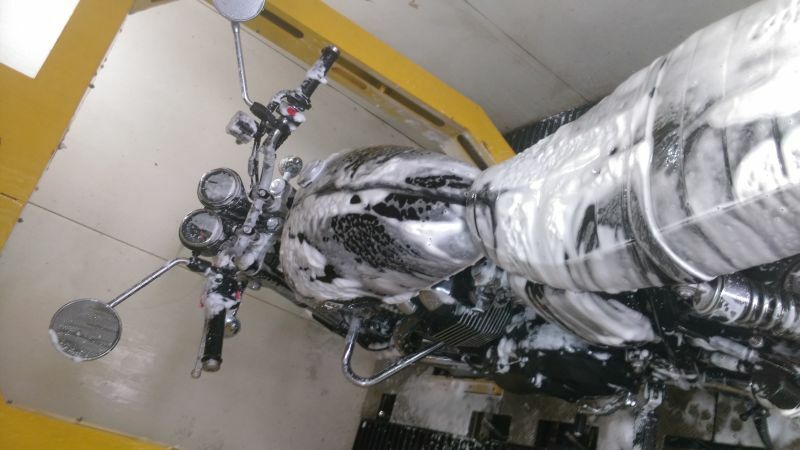 If your bike is returning from a cross-country adventure, or has severe oil and grease stains in hard-to-reach places, the automated wash may not be enough. In such cases an attendant manually sprays diesel onto the offending parts to weaken the mud and stains prior to the machine wash. The attendants are courteous and extremely forthcoming in this respect, and agree to redo a missed or dirty portion on the bike without argument, or demands for additional money; a clear indication of the customer-centric training they have received. All said, for someone as OCD as me about clean bikes, I was suitably impressed by both, the automated bike wash, and the staff’s efforts to clean every bit of the bike to my satisfaction. EBW claim that this machine uses 0.1 unit of electricity per use, and recycles a large percentage of the water used during operation. This focus on saving resources has been of prime concern throughout development and it’s admirable that only 10 to 20 litres of water are consumed per wash. Additionally they have several post-wash detailing services such as waxing, engine dressings and spray-on polishes. 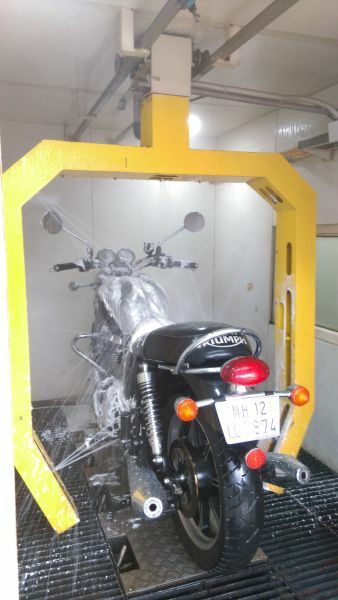 Bikers in Pune finally have a viable option to get their steeds quickly and professionally cleaned, with polishing and detailing available under one roof. The washing booth is compact, environment-friendly, has a built-in water tank and can fit into a 200 to 300-square-foot area. Plans are in motion for future models that will automate the diesel spray for degreasing, as well as a post-wash wax, further reducing the need for human interference. EBW look forward to a time when every motorcyclist in India and Southeast Asia considers them for their motorcycle care needs, and if the commitment to innovation and service is maintained, that day can’t be far away. Note: The store was manned by three attendants when our correspondent visited; they had no idea that he was a journalist and he received no special treatment.